RIO DE JANEIRO, Brazil – Colleen Quigley’s path to the Olympic Stadium starting line for Saturday morning’s 3000-meter steeplechase semifinal was littered with obstacles, not the least of which were a series of injuries which prevented her from racing for nearly 10 months. In something just short of a miracle, Quigley turned a 10-week training crash course – she called it “microwave fitness” – into a third-place finish at the U.S. Olympic Trials, posting a lifetime-best of 9:21.29 in the process. With five more weeks of training, mostly at altitude in Park City, Utah alongside her Bowerman Track Club teammates – six of whom qualified for the Games – Quigley has her focus on a top-three heat finish, or one of the next six fastest times, to earn a spot in Monday’s final. Given all that the 2015 NCAA champion and nine-time All-American for the Seminoles has overcome, confidence should not be in short supply. Quigley credits Schumacher and her Bowerman Track Club teammates – aka, #bowermanbabes – for nurturing that mental toughness in the months between her 12th-place finish at the 2015 World Championships and the U.S. Olympic Trials. The reminder of the countless hours invested in cross training when she was unable to run was all Quigley needed. “Shalane and Amy [Cragg], both, being older mentors for all of us young girls that just graduated from college has been so amazing,” Quigley said. “The reason I joined the team is the same reason I chose FSU. I wanted to surround myself with greatness. That’s the reason I chose to be around all those All-Americans at FSU, because I wanted to be an All-American. When I chose Bowerman I wanted to be an Olympian, so I surrounded myself with people who had already made it to the Olympics or who were looking at their first time just like me. Watching Flanagan work through an injury with 2-3 hours of cross training daily in advance of the marathon trials, proved to be an invaluable lesson. And Quigley will have no shortage of friends offering support Saturday and beyond. 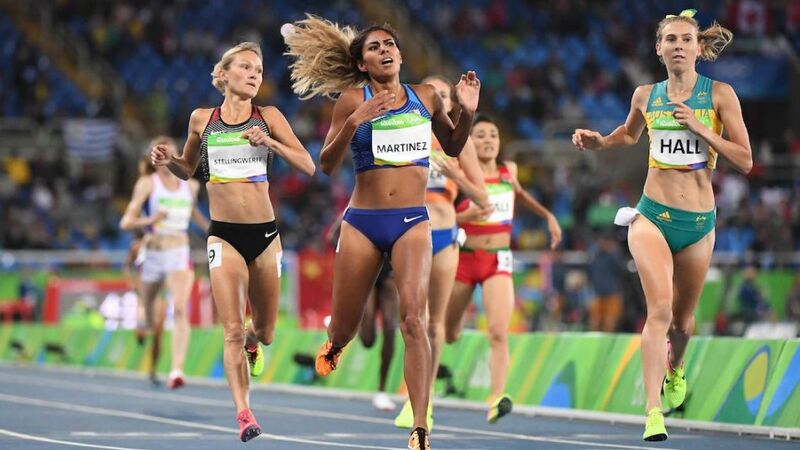 In Rio, she has reconnected with a trio of former Seminole women’s distance standouts, including former teammates Linden Hall (Australia) and Violah Lagat (Kenya) who qualified in the 1500, and Susan Kuijken (Netherlands) who qualified in the 10,000 and 5,000. Then there’s the BTC family of marathon qualifiers Flanagan and Cragg, Emily Infeld and Betsy Saina (10,000), Shelby Houlihan (5,000) and her former Missouri high school rival and road roommate Courtney Frerichs, who will line up in the third heat of the steeplechase. Frerichs and Quigley were already fast friends before storming past Stephanie Garcia over the final 120 meters to finish second and third at the Trials, behind champion Emma Coburn. It wasn’t easy. Quigley first had to suppress doubts that she was ready to make a run for Rio, having managed just two steeplechase workouts on the track and one 1500-meter race, 10 days before the prelims in Eugene. Those doubts were put to rest when Quigley laid down consecutive laps in 71, 71 and 70 seconds to finish off her Olympic quest in the finals. Quigley hasn’t stopped smiling since, though she will put her race face on in the first of three heats Saturday at 9:05 a.m. (ET). The first Seminole in action Saturday will be Kimberly Williams in the women’s triple jump. A finalist at the 2012 London Olympics, the Jamaican star will jump 16th in Group B, set for 8:40 a.m. Quigley and Williams’ events will be televised on NBCSN or available via live stream at http://stream.nbcolympics.com/track-and-field-day-8-morning. Former Seminole sprinters Marvin Bracy and Kemar Hyman will compete Round 1 of the 100-meter dash, with the first of eight heats set to begin at 11 a.m. NBC will begin live coverage of on the network station at 10 a.m. First-time Olympians and one-time Florida State teammates, Linden Hall and Violah Lagat carried the flag among former Seminoles on Friday, the opening day of track & field competition at Olympic Stadium. Hall and Lagat advanced to Sunday’s semifinals of the 1500-meter dash from separate heats to open the evening session of competition. Representing Australia and thrust into the first heat, Hall demonstrated the moxie she displayed during her three-time All-American career with the Noles. Patiently tucking into the front of the pack, she grabbed an auto berth into the semis by place fourth in 4:11.75. Two heats later, Lagat rode the wake of fastest heat of the night, advancing on time (4:08.90) to place eighth in heat three and 13th overall. It was heady performance for the Kenyan, who claimed a pair of All-American honors during her FSU career. Teammates on the 2011-2012 FSU cross country and track & field teams, they will return to the track Sunday at 8:30 p.m. for the semifinals. A trio of former Seminole 400-meter standouts – twins Kevin and Jonathan Borlee, and Alonzo Russell – were not as fortunate in the opening rounds, failing to advance. Kevin Borlee, who along with his brother was making his third Olympic appearance representing Belgium, placed fifth in heat 1 in 45.90. Jonathan Borlee (46.01) was fourth in heat 3 with Alonzo Russell, making his Olympic debut for the Bahamas, placed fifth (46.23), though he was later disqualified. “I though Alonzo ran as hard as he could,” Braman said. “He actually had the lead with 100 meters to go, but couldn’t hold it. FSU’s final representative on the opening night, long jumper Stefan Brits, came up short in his attempt to join a pair of fellow South African teammates in the final. After an opening mark of 7.46 meters, Brits came back with a second-attempt 7.71 (25-3.50) to climb into contention, before a third-attempt foul left him short of the 12-man finals. Two-time NCAA champion and nine-time All-American Susan Kuijken kicked off the day for the Seminoles on the track with a 14th-place finish in the fastest women’s 10,000-meter race in track & field history. Competing in just her second race at that distance on the track, the first-time Olympian from the Netherlands finished in 31:32.43, just a half-second off her previous best. Ethiopa’s Ayana Almaz smashed the world record (29:17.45) for the gold as four women dipped below the 30-minute mark.